If you have any trouble, be aware a full gamelog is required for support. Posts without any gamelog will be ignored! All current map DLCs (East, North, France, Italy and Baltic) are needed for this map! Returned the missing cities in DLC "Vive la France"
connect this fix above all active modifications. After the modification of the garages the fix should be disabled. Fix doesn't work correctly with MHAPro 1.28. Any updates will be posted here. Topic for reporting any bugs or issues, which you found on SRM area or caused by SRM map mod in another places. If you play SRM together with ProMods, include also this information. IMPORTANT: Post reports there in RUSSIAN language, as truck-sim.club is a Russian ETS2 community forum! You can use Google Translate and post original (preferably English) text next to translation. You should register in truck-sim.club forum for posting anything there and your first 30 posts should approved by truck-sim.club moderator. Thanks to Vladzz-G for the hint. This post is permitted by SimKA. Спасибо! Last edited by Fr8i on 28 Oct 2018 14:55, edited 118 times in total. - Dale, get out of the hot tub. We're stealing a news van. - It's the perfect crime. How will they ever report it? "It takes a big man to admit when he's wrong, but it takes an even bigger man to give a giraffe a haircut"
I understand this map is working as new profile only with RusMap ? Can I try it so ? xela1961 wrote: I understand this map is working as new profile only with RusMap ? Right now this map is only combinable with RusMap. thanks for sharing this map. yesterday i downloaded and made a new profile with connection with Rusmap. 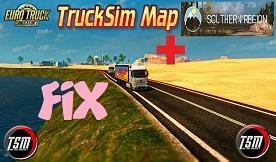 I hope that in the future this map will be compatible with promods. It's interesting, realistic map. It will be great complement combinations Promods and Rusmap. We can only hope... I wonder opinion team of promods for this thing. I've tested the map on my base-profile (Steam 1.24) and did a WOT job from Metz to Paris. Everything went fine but the map have lost it country borders. Beside the maps (Base, Rusmap, SR, Indonesia) I've nearly nothing installed.